Peripheral neuropathy is the result of damages of the peripheral nervous system. These troubles can be caused either by a trauma or diseases as for example diabetes. NEUROFIT proposes animal and cellular models able to evaluate the neuroprotective activity of your coumpounds. 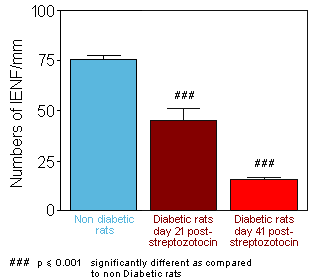 As in diabetic patients, the peripheral neuropathy in this model is characterized by reduced nerve conduction and loss of sensation as a result of skin denervation. 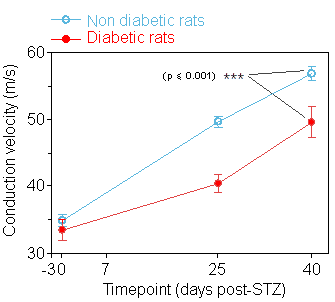 This model is used to assess the neuroprotective potential of test compounds against diabetic neuropathy. Neuroprotectant are usually tested in this model but other treatments could also be considered. Please feel free to contact us to discuss the feasibility of your study. 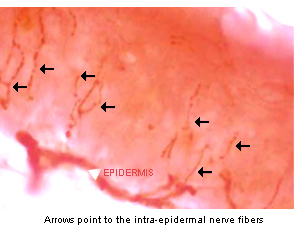 After a first painful phase, severe loss of intra-epidermal nerve fibers (IENF) in the skin hindpaw and reduction of nerve conduction velocity similar to that observed in human are observed. The degeneration of intra-epidermal nerve fibers can be monitored and quantified in various animal models of peripheral neuropathy.